What information can my landlord ask about my need for a service animal? How do I go about requesting permission from my landlord to have a service animal? Disability: The Washington State Law Against Discrimination defines disability as a sensory, mental, or physical condition that significantly limits a person’s ability to perform major daily functions (e.g., seeing, hearing, speaking, walking, breathing, performing manual tasks, learning, caring for oneself, and working). Service Animals: These are animals that work, provide assistance, or perform tasks for the benefit of a person with a disability, or provide emotional support that alleviates one or more identified symptoms or effects of a person’s disability. Service animals are not pets. A service animal must be allowed even in a no-pets building, and a landlord cannot charge a pet fee or collect a pet deposit for a service animal. The tenant is responsible for their service animal and its behavior in the building. If the service animal causes damages, the tenant may be charged for the repairs. If the animal is not house broken or is out of control and the tenant does not take effective action to control it, the landlord may ask the individual to obtain corrective training for the service animal or even to remove the service animal from their home. Also, a landlord may not ask the nature of the disability. If the disability is clearly obvious (such as a person who is blind, using a guide dog), the landlord may not ask questions about the disability or the need for the animal. The landlord cannot require documentation for the animal, such as a certificate or license. If the disability is not obvious, they may ask for a letter from the tenant’s service provider (a medical professional or other professional who knows about your disability and accommodation needs, such as a peer support group or non-medical service provider) documenting that the tenant has a disability and that there is a disability-related need for the animal. Our sample letter to request Reasonable Accommodations has language that can help you request a service animal. This post was contributed by Tenant Counselor Jeanne Winner. The tenant information contained in this article or linked to the Solid Ground Tenant Services website is for informational purposes only. Solid Ground makes no claims, promises or guarantees about the accuracy, completeness or adequacy of the information contained in or linked to its website. Solid Ground cannot act as your attorney. Solid Ground makes no representations, expressed or implied, that the information contained in or linked to its website can or will be used or interpreted in any particular way by any governmental agency or court. As legal advice must be tailored to the specific circumstances of each case, and laws are constantly changing, nothing provided here should be used as a substitute for the advice of competent counsel. Solid Ground Tenant Counselors offer these tenant tips as generalized information for renters. People with specific questions should call our Tenant Services hotline at 206.694.6767, Mondays, Wednesdays & Thursdays between 10:30am and 4:30pm. Tenant Tip: Help pass the Fair Tenant Screening Act! Current Washington State Residential Landlord-Tenant Law creates some serious housing barriers for domestic violence (DV) survivors and people living on low incomes – such as a requirement to pay separate screening fees for each new rental application. The Fair Tenant Screening Act (FTSA), going before the WA State Senate Rules & Means Committee next Wednesday, February 14, would eliminate those barriers. Contact your Senators to let them know that FTSA will help keep families housed and prevent homelessness! Below is a brief overview of FTSA by the Housing Alliance detailing why it is important for these bills to pass in order to address serious barriers to housing. You can follow this link to the Housing Alliance’s website and send an email to your senators to ask them to keep them moving in the Senate. You can also call 1.800.562.6000 and ask your senators to support SSB 6321 and SSB 6315. Substitute Senate Bill 6315 (SSB 6315) will address the high cost of tenant screening reports by asking a work group of stakeholders, including tenants, landlords and tenant screening companies, to examine how to make a portable report work in Washington, or otherwise drive down the high cost of tenant screening reports. It will also require adverse action notices when a landlord decides to not rent to a tenant and will allow a tenant to know the criteria that will be used to determine whether or not to rent to them. SB 6321 provides tenants who have prevailed in court and survivors of DV an opportunity to ask the court to seal or redact their record so that their future housing prospects will no longer unfairly be diminished. Currently, the reports generated to landlords can contain misleading, unfair and inaccurate information. They report merely if a tenant has been named in an eviction lawsuit – not the outcome, not if the tenant was wrongfully named, not if the tenant prevailed, not if the tenant’s eviction was the result of a bank foreclosing on their landlord – but nothing about the circumstances is provided. No matter the circumstances (even when they’ve won in court), a tenant is treated guilty for years to come and they struggle with a mark on their record that will cause many landlords to reject their application. This creates an extremely chilling effect on a process that ought to be accessible to tenants who want their day in court, and instead many are deterred from arguing their case while they meekly seek new housing to avoid the progression of an eviction lawsuit. Additionally, domestic violence protection orders can be listed in these reports. It is unthinkable that this information could be considered viable in fairly determining someone as a good tenant. 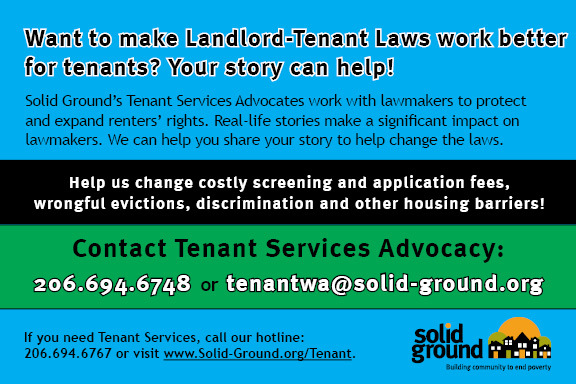 For more detailed information on the Fair Tenant Screening Act and to ask questions or share your story related to these bills, you can leave a message on Solid Ground Tenant Services Advocacy line at 206.694.6748, or email your story to tenantwa@solid-ground.org. Editor’s note: This post was submitted by Jennifer Valente, a case manager with Solid Ground’s Homeless Prevention Programs. Thanks also to Jeanne Winner for her help with the article. Imagine, you have just lost your housing – not to any fault of your own, you’ve been an excellent tenant – but your apartment is being renovated. You are wheelchair bound, you have no family or friends to help you, and you’re out of resources. You need housing immediately. 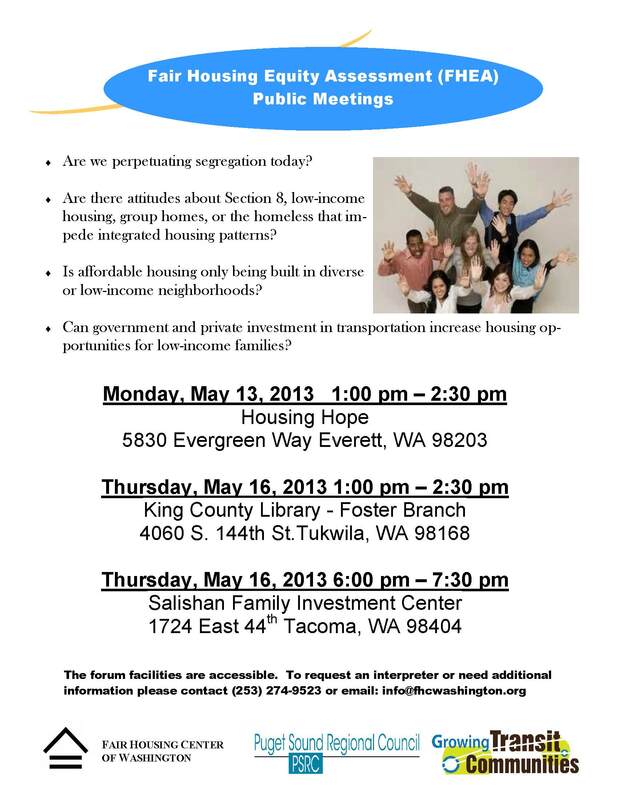 As a last resort, you call King County 2.1.1 and are directed to Solid Ground’s Housing Stabilization Services program. You ask for help. Basic knowledge of social services would lead one to believe, to hope even, that between the many Fair Housing Laws and benefits of the Americans with Disabilities Act, someone in the above situation would have a number of options available to them – that they would not end up in this predicament. Unfortunately the above scenario is far too common, and the case managers with Housing Stabilization Services at Solid Ground are often faced with trying to help clients secure housing against unfavorable odds. Specifically with regard to handicap-accessible apartments, it is not that suitable apartments do not exist – but there are too few to support the growing demand, and long waiting lists act as barriers for those in urgent need. Clients too often hear the words, “Sorry, but…” and grow frustrated and discouraged. 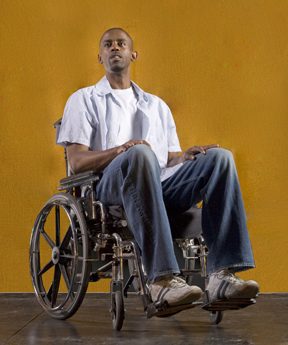 Indeed, an October 2011 press release describes testing that confirms discrimination does exist for people living with disabilities (as well as for African Americans) in far higher percentages than expected, and the Seattle Office for Civil Rights is taking action by prosecuting six property owners. The release states that more than half of all properties recently tested showed evidence of illegal housing discrimination. While the battle against discrimination is ongoing, Solid Ground is committed to being an ally to those in need. By acting as a resource hub to current and prospective tenants and providing direct case management to clients like the one above, Solid Ground serves as an advocate and friend to individuals and families who have nowhere else to turn and may otherwise end up in shelters or on the streets. Landlords typically screen prospective tenants to decide their eligibility to move into a rental unit. Often landlords hire a screening company to decide tenants’ suitability. Screeners investigate potential tenants’ credit, rental history, employment history, criminal background, previous evictions and court records. RCW 59.18.257 is the section of the Washington Residential Landlord-Tenant Act which provides information on tenant screening. The screening process can be burdensome, costly and unfair for tenants, especially if they have wrongful evictions on their record or because of their status as domestic violence survivors. One of the main challenges is that the tenant is responsible for paying the cost of screening fees which may range from $30 to $75 per application. Even if the landlord decides not to offer a unit to the tenant, the tenant loses their screening fee. Currently, tenants can be denied for any number of reasons, causing them to pay many screening fees. Often people with poor credit or evictions on their record are faced with spending hundreds of dollars on screening fees without ever being offered a unit. These fees can prevent low-income tenants from being able to afford move-in costs and can leave tenants facing homelessness. A report released this month by the Seattle Office for Civil Rights (SOCR) indicates that housing discrimination based on race or disability occurs frequently in Seattle. In their investigation, nearly 70% of landlords showed some sort of race-based discrimination in which inconsistencies favored white applicants. Disability-based discrimination tests revealed that 38% of the properties used practices that created barriers for people living with disabilities to get access to housing. Read the full press release on the SOCR webpage. These issues of discrimination in tenant screening are happening outside of Seattle as well. We receive calls on our Tenant Services Hotline from all over Washington State from tenants who face housing discrimination based on race, ethnicity, criminal history and disability status. In addition, mistakes contained in the screening reports or credit reports used to decide tenant eligibility can also cause tenants to be wrongfully denied housing. Tenants may never even see a copy of the report to find an error and dispute the inaccuracy. These inaccuracies may include wrongful evictions that were filed illegally or incorrectly. Once an eviction, or Lawsuit for Unlawful Detainer, is filed with the courts, the eviction record remains on the tenant’s public record for life. Even if the judge rules in the tenant’s favor and they win the case in court, potential landlords are still able to see the eviction on their record and deny housing. Domestic violence survivors also face discrimination in the tenant screening process, and they are often denied housing because of a protection order on their record. Even though RCW 59.18.570 states that it’s illegal to deny housing based on an individual’s history as a victim of domestic violence, sexual assault or stalking, many landlords will deny housing to these people without providing a reason. Stronger protections are needed for survivors so they do not have to face discrimination in trying to meet their basic need for safe housing. In order to make these changes, state legislators need to hear from renters throughout Washington State who are directly affected by this serious issue that creates so many housing barriers. If you’d like to share your story and be part of the advocacy effort to support the Fair Tenant Screening Act, please call our Tenant Advocacy Line at 206.694.6748 and attend the Access to Housing Forum to learn more about the Fair Tenant Screening Act and how you can help.